A Nun Inspired By Warhol: The Forgotten Pop Art Of Sister Corita Kent Kent's work, which included the U.S. 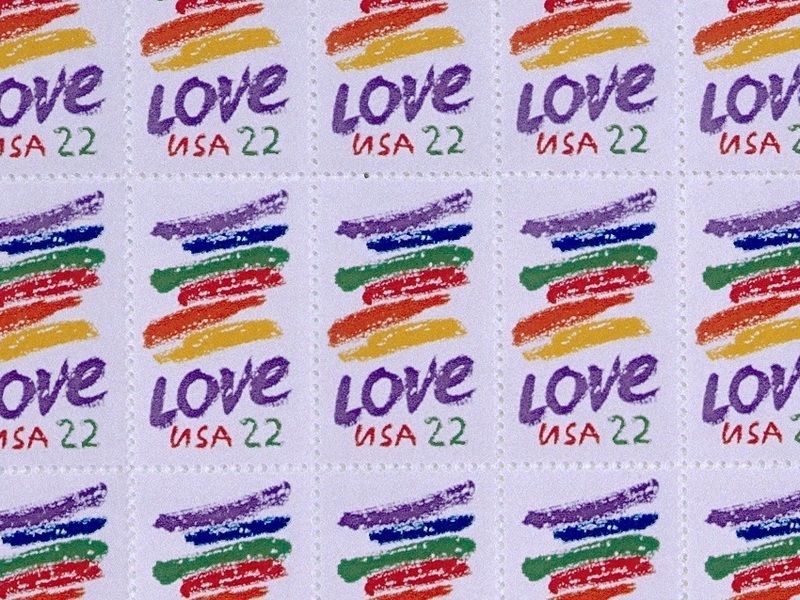 Postal Service's popular "love" stamp, had a lasting influence. But today her story seems to have fallen through the cracks of art history. 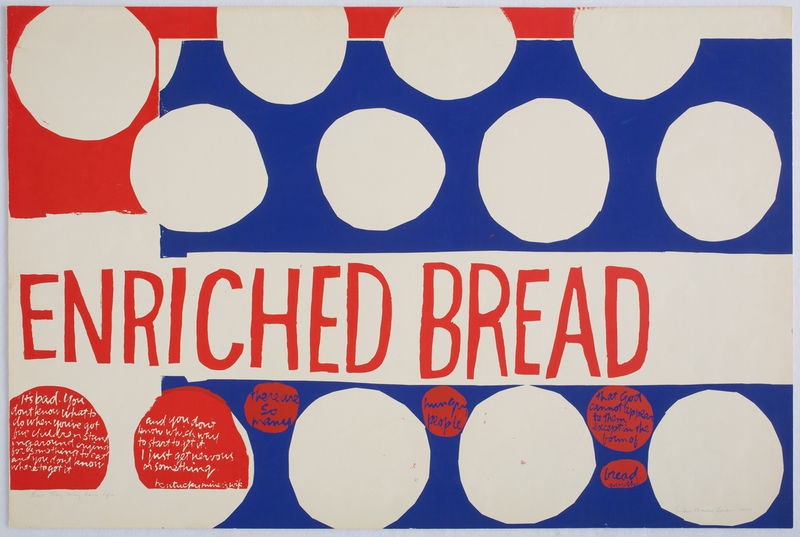 In that they may have life (1964), Corita Kent turned images from a Wonder Bread wrapper into a meditation on poverty and hunger that includes quotes from a Hazard, Ky., miner's wife and Mohandas Gandhi. Corita Kent's silkscreens were once compared to Andy Warhol's; her banners and posters were featured at civil rights and anti-war rallies in the 1960s and '70s; she made the covers of Newsweek and The Saturday Evening Post; and she even created a popular postage stamp. Yet today, Kent seems to have fallen through the cracks of art history. 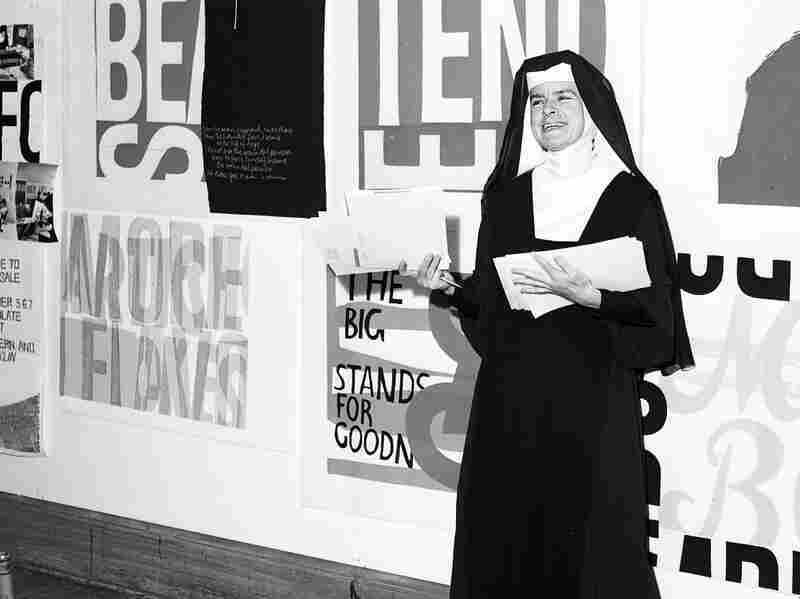 Sister Corita Kent stands in front of her work, including for eleanor, at Immaculate Heart College in 1964. An exhibition created by Skidmore College's Tang Teaching Museum, and which opens later this month at Pittsburgh's Andy Warhol Museum, aims to change that. Ian Berry co-curated "Someday is Now: The Art of Corita Kent," a retrospective of Kent's 30-year career, and has a good idea of why her artistic reputation has taken a hit. He says, "An 'artist' was from New York. They were a man; they were an epic, abstract painter. And she wore a habit — she just didn't look like what the, sort of, movie version of an artist looked like." 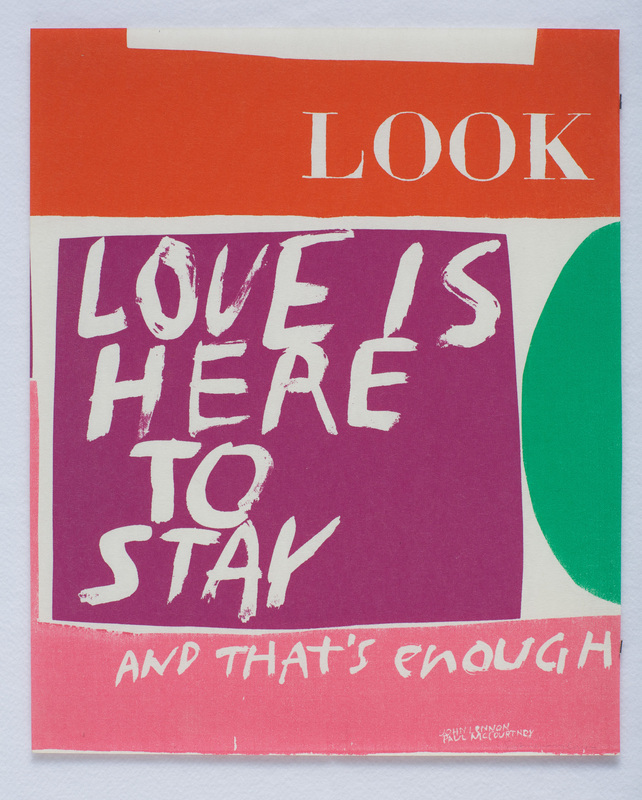 Sister Corita Kent headed the art department at Immaculate Heart College in Los Angeles. Graphic designer and art historian Lorraine Wild says Sister Corita, as she was known, had already been experimenting with the silkscreen printing process when she saw a now legendary 1962 exhibition of Warhol's work. Kent's for eleanor (1964) plays off General Mills' slogan. "What she got from Warhol, clearly, was that there was this powerful imagery in pop culture that came out of advertising," Wild says. "And that if you just looked at it from a slightly different angle, you could read all these other things into it, and it already had a kind of power because the audience was familiar with it." 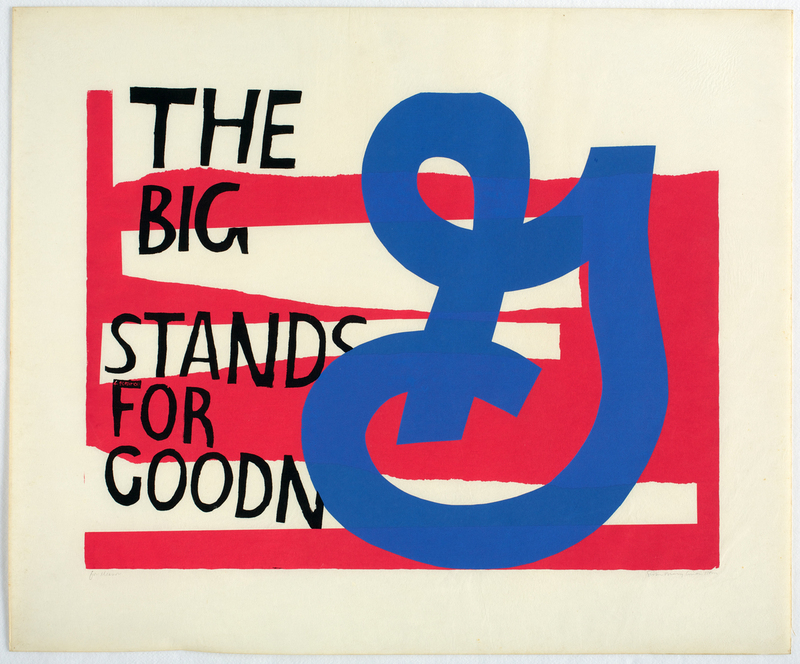 One slogan she appropriated was General Mills' "The Big G stands for Goodness," which referred to the capital G the company used for its logo. "And she turns that into 'G,' 'God;' 'goodness,' 'spiritual goodness,'" Wild says. Kent also freely juxtaposed advertising logos with Bible verses and quotes from Gertrude Stein and e.e. cummings. In her hands, images from a Wonder Bread wrapper turned into a meditation on poverty and hunger. According to Doris Donnelly, who taught in the religious education department at Immaculate Heart College while Kent was there, the artist was also tuned into the Top 40. "This is the early '60s. In general, nuns wouldn't know the Beatles," Donnelly says. "She knew the Beatles. She understood the lyrics of the Beatles." 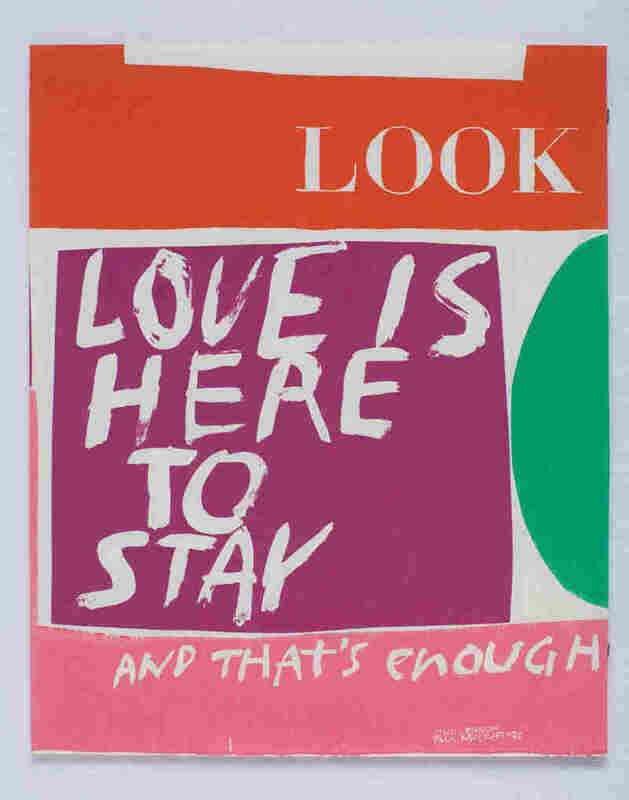 In fact, Kent quoted the Beatles' "Things We Said Today" in a 1965 piece called look, which appropriates the logo from Look magazine followed by the words "Love is here to stay. And that's enough." Kent not only knew about the Beatles, she also understood their lyrics, which she used in 1965's look. Her work was also inspired by the Second Vatican Council — or Vatican II, as it was popularly known — which led to major reforms in the church ranging from conducting services in English instead of Latin, to allowing nuns to wear secular clothes. The nuns at Immaculate Heart quickly embraced those reforms, to the displeasure of the local archbishop. "Cardinal McIntyre," Donnelly says. "He thought they were going too far, too fast." According to Donnelly, mounting pressure from the cardinal finally prompted Kent to make a hard choice. "I was in my office and one of my colleagues came in and she sat down and she said, 'Corita's leaving.' It was a total surprise and it was a sad day." Kent left the college and its convent in 1968, but she never left the church. She moved to Boston to continue her art work. A poster from the following year features news photos from the Vietnam War accompanied by a Walt Whitman poem that includes the line: "Agonies are one of my changes of garments." According to curator Ian Berry, Kent's themes started getting darker for several reasons. Kent created her "love" stamp for the U.S. Postal Service in 1985. "She was struggling with disease toward the end of her life," he says. "She fought cancer three times and she was struggling with what that was doing. And she was struggling with what was going on in the world, and that comes out in the artwork, for sure." Still, in 1985 she created a stamp for the U.S. Postal Service based on one of her favorite themes: love. Over 700 million were sold. She succumbed to cancer the following year. Alexandra Carrera, director of Los Angeles' Corita Art Center, a repository for Kent's work, argues that Kent had a lasting influence on pop art. She also says Kent's legacy is far different from that of East Coast peers like Andy Warhol. "She was directing people," Carrera says. "And rather than just standing back and being like, 'This is what's going wrong, and I'm just showing you guys because I'm so cool and I'm not going to be part of it,' she was really asking people to engage. And I think that that is a more popular message today than it was 20 or 30 years ago."